We’re warming up winter with some irresistibly delicious, flavour-filled, joy-filled, story-filled additions to our menu. We have some new crispy, wood-fired pizzas dripping with melted cheese and exploding with wonderfully exciting winter topping combinations... and we'll give you one for free. 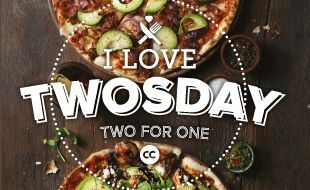 Introducing the Col’Cacchio ‘I Love Twosday’ winter special. Buy one pizza or pasta and get the other one free. One main meal per customer. Surcharge on additions, wheat-free, gluten-free and Low-carb bases. Exclusive on Tuesday’s from 8th May to 31st July 2018 only. Not Valid on ½ and ½ Pizzas. This promotion is not available in conjunction with other promotions or the Col’Cacchio loyalty app. We reserve the right to amend or terminate this promotion at any time.